Turn your Mac into a video production monitor. Is there a better alternative to DV Monitor Pro? Is DV Monitor Pro really the best app in Video category? Will DV Monitor Pro work good on macOS 10.13.4? DV Monitor Pro software is an indispensable production tool for professional and amateur videographers to view, record, optimize and organize live video on a Mac. Instantly go from shooting to editing in Final Cut Pro with all the shot ratings, labels and comments transfered from DV Monitor Pro. DV Monitor Pro's Exposure Zebras, Screen Calibration, Focus, Shot and Continuity checking tools will save much time and headaches while avoiding having to fix these issues later in post-production. Includes all the features of DV Monitor. Real Time Markers- Using the 0 through 9 keys to quickly add pre-named Markers to your clips during recording to quickly find important spots when editing in Final Cut Pro. Real Time Marker Sets- Create as many different Marker sets as you need for different styles of shooting. Mac OS X 10.4 or later, core image support highly recommended. DV Monitor Pro needs a rating. Be the first to rate this app and get the discussion started! 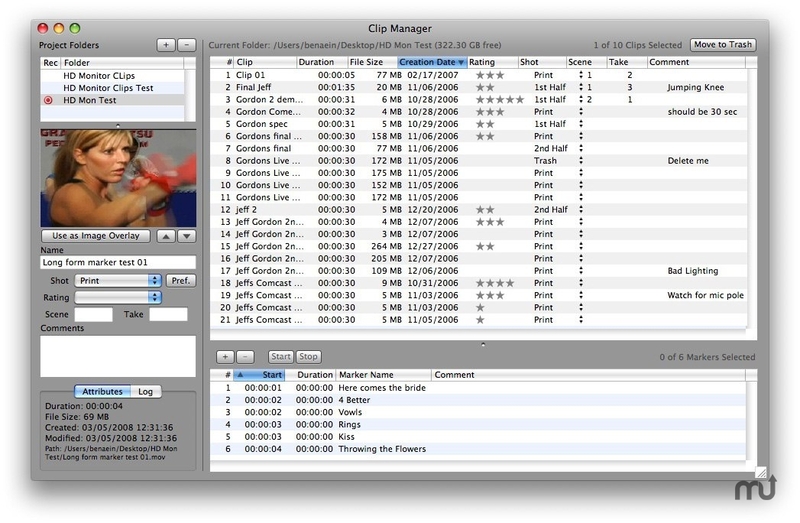 Export Clip list as Text- Exports a text file of all your clips with all their notes and markers to a text file.